Public Acts of Drawing by MakeSh!t. Rendering courtesy the artists. Public Acts of Drawing in 2012. Video by Paul Schmelzer. 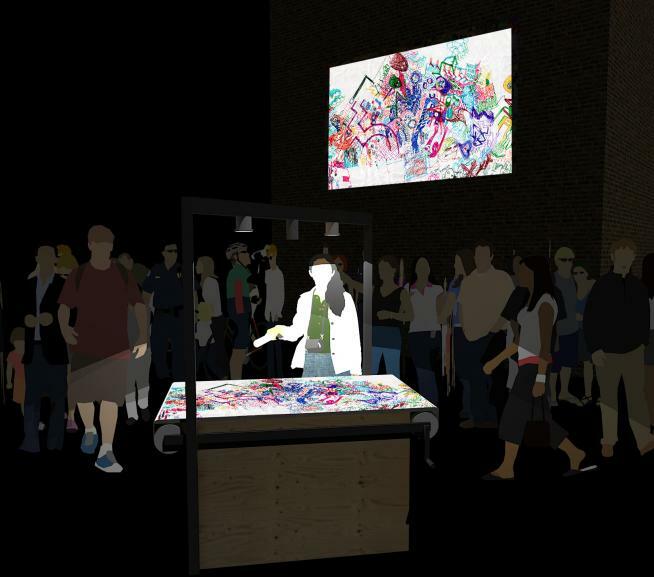 Public Acts of Drawing is a real-time art-making event that merges free-form collaboration with large-scale urban spectacle. Participants put pen to paper alongside local artists, dignitaries, and a few hundred friends. Drawers of all ages, skill levels, and styles are welcome. Special contributors will help steer and energize the proceedings, but the results are delightfully unpredictable. Over the course of the night, the individual marks of many will become a vibrant lattice of interpenetrated doodles, the Hive Mind documented in graphite and ink. Ground Zero for the project is a spacious drawing table with a hand crank that provides a gradual feed of fresh paper, lit by energy-efficient LEDs. Using a GoPro camera linked to a high-powered projector, the draw-a-thon is simulcast on downtown architecture, turning each small gesture into a heroic act. Public Acts of Drawing made its debut in 2012 on the (now destroyed) Pillsbury A Mill in St. Anthony Main. It’s a project of MakeSh!t, a free-form collective founded in 2010 with a mission to explore the social and process-based aspects of art—in other words, collaborative making. Current members include Lucas Alm, Justin Heideman, Aaron Marx, Jake Nassif, Craig Phillips, Paul Schmelzer, and Witt Siasoco.